A number of Irish Language projects supported by Northern Ireland Screen’s Irish Language Broadcast Fund are set to broadcast on TG4 over the Christmas period. 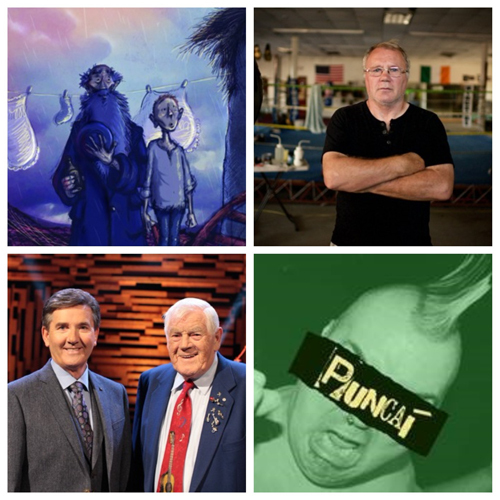 Rocky Ros Muc, a film directed and produced by Belfast based production company Below The Radar, will broadcast on Christmas night at 9.30pm. The feature follows the story of Galway boxer Sean Mannion, a world-class boxer who left the Irish-speaking village of Ros Muc in Galway, for Boston, in the 1970s. The film follows Mannion’s fighting spirit inside the ring as a professional boxer against his life outside the ring where his sparring partners and friends at the time were at the heart of Whitey Bulger’s notorious Winter Hill gang and the South Boston criminal underworld. An Béal Bocht, an animated adaptation of Flann O’Brien’s only novel written in Irish, will have its TV premiere on Christmas Day at 5.25pm. The film was produced by local producers Pearse Moore and Tom Collins and animated by John McCloskey through their Nerve Centre based production company, Raw Nerve Productions. The animation is a biting satire of the life story of a young Gael reflecting on his life from Sligo Gaol starring Seán Misteál, Donncha Crowley, Tommy Tiernan and Bob Quinn. Popular country music series Opry Dhoire continues with a special tribute show to legendary singer Big Tom on Boxing Day at 9.30pm. The series, which is presented by Daniel O’Donnell and Lynette Fay, is recorded in front of a live audience and brings the essence of Nashville’s Grand Ole Opry to Derry. Big Tom performs some of his greatest hits such as ‘Gentle Mother’, ‘Texas when I die’ and ‘Four Country Roads’. Irish singer Kayla McDonagh will also feature on the special programme, which is produced by Big Mountain Productions. Puncaí, which broadcasts on Thursday 28th December at 9.30pm, is a new Dearcán Media production following six Irish speaking punks who determine what it means to be a punk in Ireland. The programme looks back at Ireland in the 1970s when many young punks stepped outside of the mainstream during a time of conflict in Belfast and a depressed economy in Cork and Dublin. At the heart of these stories is the music and politics that inspired them, brought them together and helped define who they were. Audiences can enjoy all the Irish Language content again on the TG4 Player after initial broadcast: http://www.tg4.ie/en/player/home/. Tá roinnt tionscadal Gaeilge a fuair tacaíocht ó Chiste Craoltóireachta Gaeilge Scáileán Thuaisceart Éireann le craoladh ar TG4 an Nollaig seo. Is ar oíche Lá Nollag ar 9.30 i.n. a chraolfar Rocky Ros Muc, scannán a stiúir agus a léirigh Below The Radar comhlacht léiriúcháin de chuid Bhéal Feirste. Is scannán é ‘Rocky Ros Muc’ a dhéanann cur síos ar shaol an Ghaillmhigh, Seán Ó Mainnín, dornálaí den chéad scoth a d’fhág Gaeltacht Ros Muc sna 70í chun aghaidh a thabhairt ar Bhostún. Scrúdaíonn an scannán seo miotal an Mhainnínigh mar dhornálaí gairmiúil sa chró mar aon leis an saol a bhí aige lasmuigh den chró chéanna mar a raibh a chuid céilí speárála sa ghiom ag croílár dhrong Whitey Bulger agus domhan na coiriúlachta i mBostún Theas. Craolfar An Béal Bocht cóiriú beochana ar an aon úrscéal Gaeilge amháin a scríobh Flann O’Brien ar Lá Nollag ar 5.25i.n. Beirt léiritheoirí áitiúla a léirigh an scannán mar atá, Pearse Moore agus Tom Collins, agus ba é John McCloskey a rinne an obair bheochana ina gcomhlacht léiriúcháin Raw Nerve Produtions sa Nerve Centre. Is aoir fhíochmhar é an beochan ar shaol Gaeilgeoir óg agus é ag machnamh ar a shaol ó Phríosún Shligigh. Is iad Seán Misteál, Donncha Crowley, Tommy Tiernan agus Bob Quinn na príomhaisteoirí ann. Beidh comóradh ar leith ag an tsraith cheoil mhóréilimh Opry Dhoire ar amhránaí mór le rá, Big Tom ar Lá Fhéile Stiofán ar 9.30 i.n. Taifeadadh an tsraith i láthair lucht féachana beo, agus í á cur i láthair ag Daniel O’Donnell agus Lynette Fay. Is ann a thugtar croí Grand Ole Opry Nashville go Doire. Canfaidh Big Tom cuid dá chuid amhrán is cáiliúla, ina measc ‘Gentle Mother’, ‘Texas when I die’ agus ‘Four Country Roads. Beidh Kayla McDonagh ar an chlár mar aoi speisialta ag Big Tom. Is é Big Mountain Productions a léirigh an tsraith. Is léiriúchán nua de chuid Dearcán Media é Puncaí, clár a chraolfar ar Déardaoin 28 Nollaig ar 9.30i.n. Beifear ag leanúint seisear puncaí a bhfuil Gaeilge acu chun a fháil amach cad go díreach atá i gceist le saol an phunc in Éirinn. Caitheann an clár súil ar Éirinn sna 1970í, tráth a raibh go leor puncaí óga ag imeacht ón ghnáthshochaí. Ba chorrach ghuagach an tréimhse i mBéal Feirste é agus bhí lag trá eacnamaíochta i gCorcaigh agus i mBaile Átha Cliath chomh maith. Tá an ceol agus an pholaitíocht a thug spreagadh dóibh, a thug le chéile iad agus a thug brí dóibh mar dhaoine de dhlúth agus d’inneach na scéalta seo. Is féidir an t-ábhar Gaeilge ar fad a fheiceáil arís ar Sheinnteoir TG4 i ndiaidh a chraolta: http://www.tg4.ie/en/player/home/.